Hannans North > Blog > Looking For Somewhere Special For Your Wedding? In the historic setting of HannansNorth, where the Western Australian Gold Rush took place, you can have a wedding day of comfort and decadence in our Chinese Garden of Remembrance. Tucked away in Kalgoorlie, in the heart of the local tourism attractions of the Hannans North Mine and the Super Pit, the venue has all the perfect finishing touches to make your wedding day unforgettable; from a 6m red carpet, to decorated wedding arch to frame your perfect photos together of the ceremony. When you’re in the lush greenery of the Gardens, with low bridges leading across swirling koi ponds, and the sweeping style of Chinese architecture and gazebos, it’s impossible to take a bad picture! 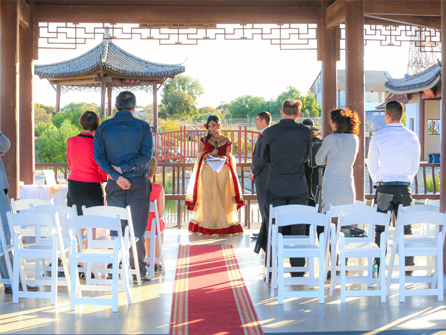 Ideal for intimate ceremonies, the Chinese Gardens offers 30 white covered guest chairs, and two trestle tables with fitted tablecloths. And your wedding day is just as special to staff as it is to you, with a dedicated team there to oversee the venue and manage the big day. Have a day filled with warm, natural light, beautiful structural facades, and the people you love, at a lush oasis in Western Australiasstunning historic wild west. The Gardens were designed to celebrate the contributions made by overseas prospectors to our Australian goldfields, and today the Gardens are symbolic of honouring the past, engaging in the present, and inspiring the future- all sentiments which carry a particular significance on your wedding day. The Garden of Remembrance was created in keeping with authentic Chinese style, and was brought over in shipping containers to be assembled with traditional techniques. The waterfall, lake, and pavilion all follow centuries-old tradition of landscape design, and are surrounded by the era of Western Australias prosperity, creating a rich atmosphere steeped in two histories, seamlessly blending and complimenting one another. Contact our functions hire team to discuss availability.